The Eye Center is committed to providing comprehensive, gentle, quality eye care services in a comfortable, family-oriented environment. We emphasize personal care that provides treatment for visual problems as well as recognizing what our patients’ eyes tell us about their overall health. We care about ensuring convenient access to great eyewear for our patients. 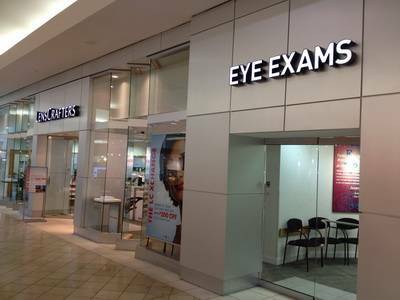 As Independent Doctors of Optometry located next to Lenscrafters, we work together to give you the best eye care and the best eye wear quickly and efficiently! Visit our eye doctors in Wilmington, NC for your next eye exam! We have five other locations in North Carolina: Burlington, Fayetteville, Durham, Cary, & Raleigh NC! So accurate, this technology takes the guesswork out of your prescription. Learn more about what problems can be spotted with an eye exam at The Eye Center, what’s involved in a comprehensive exam, and special considerations for kids and contacts. At The Eye Center in Wilmington, NC our optometrists understand that early identification of a child’s vision problem is crucial. Full Diagnosis and Treatment of Glaucoma, Macular Degeneration, Surface Ocular Disease and Injuries. The Eye Center also provides Emergency Services such as foreign body removal and conjuctivitis. Pre and Post Operative Refractive surgery care for Lasik, Lasek, PRK, Cataract Procedures. Thorough Analysis of Ocular function using the Latest in Opthalmic Technology. From our six locations near Lenscrafters we serve the areas of Durham, Raleigh, Chapel Hill, Greensboro, Wilmington, Fayetteville, Burlington and Cary. Come check out our wide selection of contact lenses in Wilmington, NC! Providing Eye Care to the Following Areas: Durham, Raleigh, Chapel Hill, Greensboro, Wilmington, Fayetteville, Burlington, and Cary.